Each coin’s reverse bears the same Panda design as depicted on the 2009 Gold Panda and 2009 Silver Panda bullion coins. The new commemoratives, however, feature a ring surrounding the pandas with the inscription "30TH ANNIVERSARY OF THE ISSUANCE OF THE CHINESE MODERN PRECIOUS METAL COMMEMORATIVE COINS." The obverse design of both coins has the traditional image of the Hall of Prayer for Good Harvest in the Temple of Heaven in Beijing. The central bank said it would issue a maximum of 10,000 gold coins in 1/4 oz size, with a diameter of 22 mm and a fineness of 99.9%. Up to 300,000 of the 1 oz silver coins are to be struck with a diameter of 40 mm and the same bullion 99.9% purity. The legal tender face value of the gold and silver commemoratives are 10 and 100 yuan, respectively. Panda coins are among the most popular in the world, featuring adorably detailed images of playful pandas that change annually. 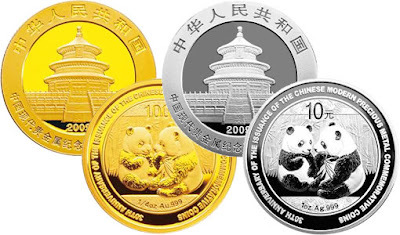 Although the Chinese precious metal coin program dates back to 1979, the Gold Panda coin design was first introduced in 1982 while the silver version debuted in 1983.